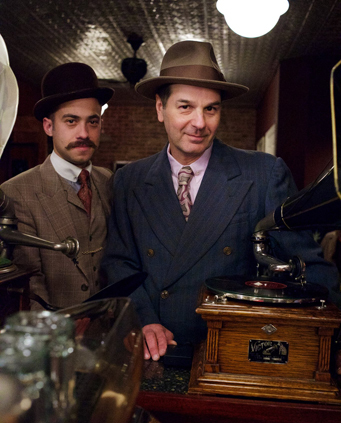 Like WFMU itself, which takes pride in its esotericism (the lead-in to The Best Show for years was The Ragged Antique Phonograph Program, which played only 78s or cylinders on period equipment), The Best Show is a cult phenomenon. Its most hard-core listeners can literally become card-carrying fans: “Friends of Tom” are issued membership cards signed by Scharpling. For years, finding out about the show took some digging. Chicagoans who wanted to hear it had to visit the tristate area or find one of five CDs that Scharpling and Wurster self-released between 2002 and 2007. That finally changed in 2008, when they added a podcast. But no, apparently, that really was the lead-in. Here’s a photo of the hosts from their website, where you can listen to probably over a hundred episodes. This world is truly amazing. I wonder if there’s a big future in documentary or “reality” comedy, that’s not making anything up but just observing and capturing the absurdities of what exists, the way all my friends watch documentaries now? The trouble there might be it’s very difficult to construct a documentary that is purely funny without a strong dose of some pathetic sadness or hopefulness or something — you can’t get undiluted laughs out of unconstructed reality? If the goal is simply, “watch something that makes me laugh” might be hard to capture.